By Abraham Goos Published by Johannes Janssonium, Amsterdam 1661 in Philipp Cluver's. Introductionis in Universam Geographiam, Tam Veterem Quam Novam Libri VI. 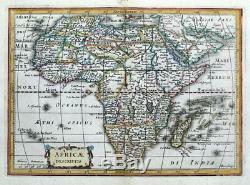 An original 17th century copper engraved miniature antique map of the continent of Africa. An attractive map with surprising detail. Strapwork title cartouche and scale of German miles. Printed on robust hand laid paper, blank verso. Enhanced with attractive later hand colouring. Free of repairs or restoration. 8" x 5.5" (200mm x 135mm) map area only, with good margins beyond. Philipp Cluver (1580 -1622) was an early German geographer and historian who published a number of works on the antiquities of Germany, Sicily, and the Rhine valley. He went on to produce a number of miniature atlases including the Introductionis in Universam Geographiam which was published after his death from 1624 onwards. This example is from Jansson's edition of 1661. The maps were engraved by several leading cartographers of the time, predominantly by Pieter Van Den Keere, and others by Abraham Goos and Abraham Ortelius. A GENUINE ANTIQUE MAP GUARANTEED OVER 350 YEARS OLD FROM LINDISFARNE PRINTS. We do not deal in reproductions, facsimiles or modern copies of any kind. Goos, Cluver, Jansson original antique map 1661" is in sale since Monday, January 14, 2019. This item is in the category "Antiques\Maps, Atlases & Globes\Africa Maps". The seller is "lindisfarne2" and is located in Shrewsbury.